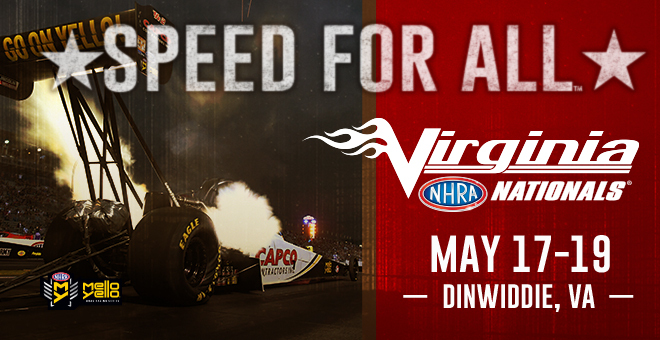 Making its first appearance at the track since 2009, the NHRA Mello Yello Drag Racing Series had a memorable return to Virginia Motorsports Park in 2018 and will power back to the fan-favorite track in 2019 for the second annual NHRA Virginia Nationals, May 17-19. It is the eighth of 24 events during the 2019 NHRA season and will be one to remember, as evidenced by a 2018 race that drew sold-out crowds, incredible action and remarkable performances on the brand new racing surface at the track. It led to one of the most exciting weekends of the NHRA regular season and more pulsating 10,000-horsepower, 330-mph action will return in 2019 to provide more of the same thrilling sights, sounds and adrenaline-fueled action.